Osteoarthritis (OA) and repetitive, high impact activities, such as running, are common causes of joint pain and reduced physical function. Joint pain and/or loss of mobility can result from cartilage damage or degradation. Cartilage is a tough and flexible connective tissue found at the ends of bones and joints. It prevents bones from rubbing against each other, and acts as a cushion during movement. Collagen proteins and proteoglycans are integral to the natural structure of cartilage, and help maintain its strength. Cartilage damage and degradation may be caused by many factors, including aging, obesity, repetitive high impact activities or injuries. As we age, our body’s natural ability to produce new collagen declines, often resulting in joint pain, and reduced mobility. Wellnex collagen peptide contain two key di-peptides, hydroxyproline-proline, and hydroxyproline-glycine. These diepeptides may help regulate chondrocyte (cells found in healthy cartilage) diﬀerentiation, and play a key role in the maintenance of mature chondrocytes in cartilage. Research suggests that hydroxyproline-proline and its regulatory mechanism may be responsible for the therapeutic eﬀect of collagen peptides in improving joint conditions. 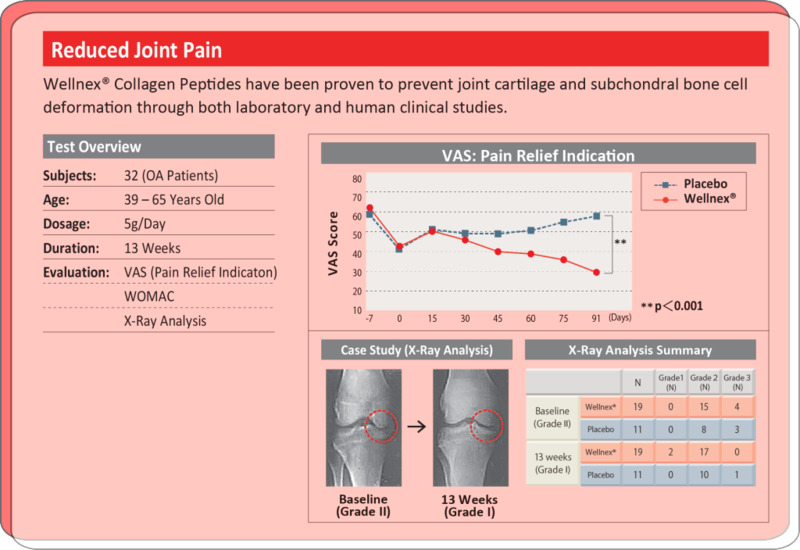 A published clinical study revealed that 63% those taking Wellnex collagen peptides saw significant improvement in joint pain after 13 weeks of supplementation. In contrast, the placebo group showed 63% reporting no improvement in joint pain. Wellnex collagen peptide supplementation promotes the accumulation of collagen peptides in cartilage tissue. This increase in collagen peptides, and its subsequent restructuring, may lead to reduced joint pain. A Japanese 2018 clinical study carried out in collaboration between Josai University, Saitama Medical University and Nitta Gelatin, Inc., revealed that dietary supplementation with Wellnex collagen peptides resulted in a reduction of 3-Methylhistidine, a muscle breakdown marker, in long-distance runners. 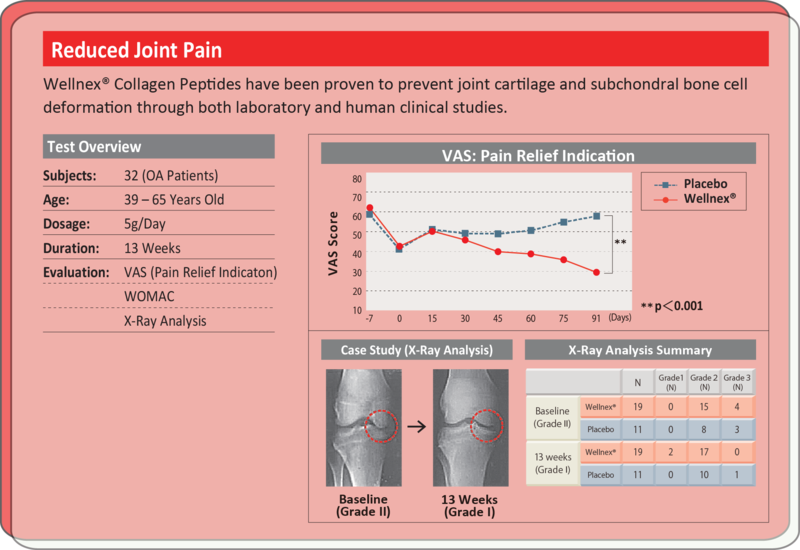 Reported knee pain for the runners was also significantly lower for the collagen peptide group, as compared to placebo.